Tim Ambrose steered Warwickshire to a first innings lead over Nottinghamshire on the second afternoon of their Specsavers County Championship tussle at Edgbaston. After bowling the visitors out for 152, Warwickshire hit trouble of their own when a pre-lunch burst of three for 12 from Jake Ball reduced them to 28 for three. But the home side went into tea on 162 for five thanks to a recovery led by Tim Ambrose (55 not out, 76 balls, 11 fours) and Sam Hain 39 (69 balls, six fours). Warwickshire resumed after lunch with Varun Chopra, Andy Umeed and Ian Bell already back in the hutch and they were soon joined by Jonathan Trott who fell lbw to Brett Hutton’s fifth ball. 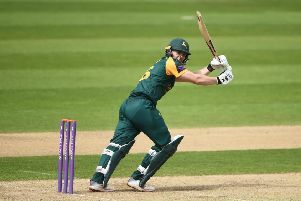 But against an attack hampered by the loss of Luke Fletcher, who limped off the field after delivering the first ball of his 11th over, Hain and Ambrose halted the collapse with a stand of 69 in 15 overs. They saw off the seamers before Hain lost concentration against off-spinner Matthew Carter and edged behind. But Rikki Clarke then joined Ambrose to add an unbroken 45 in ten overs up to tea.